With temperatures remaining high and forecasters predicting a sizzling summer across the UK, we are urging pet owners to keep their animals safe. 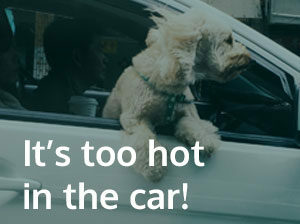 Martin Leith clinical director at Leadon Vale Veterinary Centre, is urging people not to leave their pets in cars or conservatories during the hot weather. Martin said: “Temperatures inside a car can reach 120 degrees within minutes and it’s possible for animals to die from heatstroke or dehydration. “We would advise against taking pets outside on hot days and ensuring they have plenty of fresh water and cool areas to stay in. Martin’s advice is to keep pets indoors or sheltered when temperatures are high, usually between 11am and 3pm. However, if animals enjoy basking under blue skies then a splash of sun cream could be the answer. He said: “Many animals, particularly those with thin or light-coloured fur, are highly susceptible to sunburn and even skin cancer, so it’s important to protect areas such as the ears, nose, lips, eyelids and tummy, which often have little to no hair on them and are very much at risk. “Pets with light skin and short, or thin, hair, such as white dogs, are more susceptible to developing skin cancer, especially if they spend a lot of time outdoors. However, animals with hair can also suffer from the effects of the sun. The Met Office is predicting waves of high temperatures and sunny spells over the coming weeks, with the UK set to bask in hot weather throughout much of September.